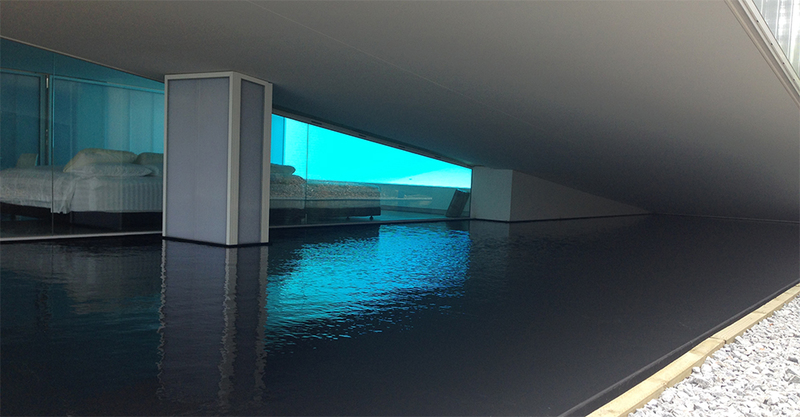 Recently commissioned, just in time for Christmas, here is an example of a reflection pond used in artistic architecture by Robin Williams Architecture. With sea views out the back of the property, the reflection pond helps continue the water through the yard into the house connecting with the glass walled pool. With the key design goals of space, natural light, and water at the forefront, this installation reflects both the sunrise through the indoor pool onto the angled ceiling and the sunset over the ocean. When the pond lighting is completed the ripples over the water surface will be reflected onto the ceiling and through the lower room to the swimming pool – keeping the brief through all hours of day or night. Keep an eye out over the coming month as we get some more images to post up.